Background Little is known about in-stent stenosis (ISS) in patients with aneurysms treated with flow diverter (FD) stents. The reported incidence in the literature varies significantly. Objective The aim of this study was to assess the incidence, severity, distribution, clinical significance, and possible predictors for ISS. Methods Between July 2012 and June 2016 we retrospectively reviewed all patients treated with SILK FDs in our center. Only cases with short-term (4±2 months) and long-term (>1 year) follow-ups with digital subtraction angiograms were included. ISS was graded as mild (<25%), moderate (25–50%) or severe (>50%). 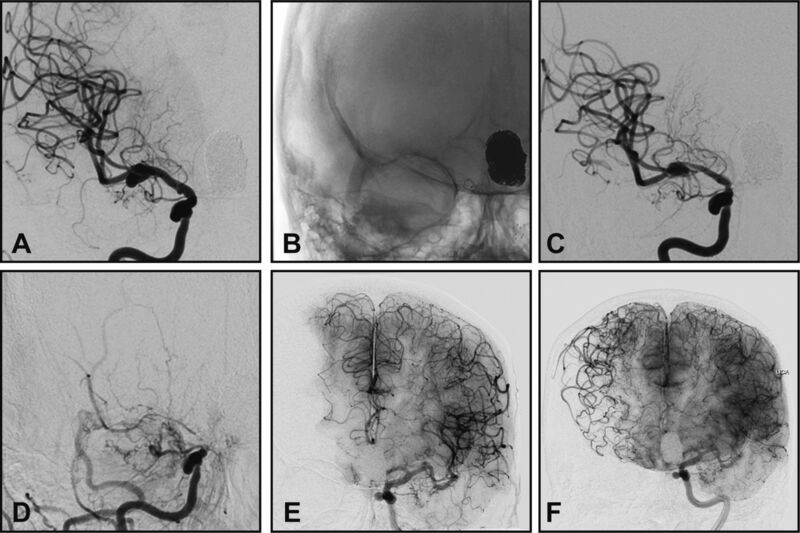 The following predictors for ISS were assessed: gender, age, the presence of subarachnoid hemorrhage, aneurysm size, location, occlusion status, and post-stenting angioplasty. Results Thirty-six patients met the inclusion criteria. At mid-term follow-up, ISS was observed in 16/36 patients (44%). Eleven patients (69%) had mild ISS, three (19%) moderate, and two (12%) severe ISS. ISS was diffuse in 11 patients (69%) and focal in five patients (31%). All patients were asymptomatic. Thirteen patients were maintained on dual antiplatelet therapy and three on aspirin alone. At long-term follow-up, complete ISS resolution was seen in 11 patients, improvement in three and worsening in two patients. No de novo ISS occurrence was observed. On univariate analysis there was no significant predictor for ISS. Conclusions Transient ISS after FD deployment is a common asymptomatic finding on mid-term angiographic follow-up. Complete resolution or improvement at long-term follow-up is seen in most patients who are maintained on dual antiplatelet therapy. In this study we report the incidence, severity, and clinical significance of ISS in patients with intracranial aneurysms treated with FD stents. We describe its evolution in time and assess potential clinical, procedural, and imaging predictors of ISS development. We retrospectively reviewed consecutive patients who underwent treatment of intracranial aneurysms with SILK (Balt, Montmorency, France) FDs in our institution from July 2012 to June 2016 after acquiring institutional Research Ethics Board approval. Cases that had available short-term (4±2 months) and long-term (>1 year) follow-ups with digital subtraction cerebral angiography (DSA) were included. All procedures were performed by an interventional neuroradiologist (DI) or an endovascular neurosurgeon (HL), both with more than 10 years of experience. Procedures were performed under general anesthesia in the usual manner; by an ultrasound-guided femoral puncture using a long sheath, guiding catheter, microcatheter, and micro-guidewire to deploy the FD. Balloon angioplasty was performed when needed to achieve full FD apposition against the parent artery wall. A final global angiographic run was obtained to rule out immediate post-procedural complications. As per our institutional protocol, patients were started on dual antiplatelet therapy, daily 81 mg aspirin and 75 mg clopidogrel, 5 days prior to FD deployment. If urgent management was required, loading doses of 325 mg aspirin and 300 mg clopidogrel were administered the day before the procedure. If resistance to clopidogrel was suspected, 90 mg ticagrelor was administered twice daily instead, with an initial loading dose of 180 mg ticagrelor in urgent situations. Due to insufficient evidence,9 10 platelet function testing is not routinely performed in our institution. If clopidogrel resistance is suspected—that is, intraoperatively, from thromboembolic complications—intra-arterial abciximab is given during the procedure and a loading dose of ticagrelor is administered through a nasogastric tube right after the procedure. After the procedure, patients were maintained on aspirin indefinitely. Clopidogrel or ticagrelor were continued until the first (short-term) angiographic follow-up and discontinued if no ISS was noted. In the case of ISS, clopidogrel or ticagrelor were maintained until the second (long-term) angiographic follow-up at 1 year. If ISS still persisted, clopidogrel or ticagrelor were maintained accordingly and stent patency was assessed by annual cerebral angiograms. As per our institutional protocol in following up patients after FD stent deployment, all patients undergo DSA at 3 months and 1 year. A baseline MRI/MRA is also performed the next day, followed by MRI/MRA at 3 months, 1 year, and annually (for the first 5 years) and then every 2–3 years indefinitely. On DSA we evaluate aneurysm occlusion and the presence of ISS, while on MRI/MRA we evaluate aneurysm recurrence, the presence of ischemic changes and in the rare case of mass effect on adjacent brain structures in large aneurysms. Stent patency or ISS is subotimally and indirectly assessed on MRI/MRA due to stent susceptibility artifact. The baseline demographic and clinical data including patient age, gender, functional status (assessed by the modified Rankin score (mRs)), location and size of aneurysm, history of aneurysm rupture, smoking, hypertension, and antiplatelet use were collected by a neuroradiologist (FE). The procedure and follow-up angiographic images were reviewed and data were collected by an interventional neuroradiologist (DI) and a neuroradiologist (FE) in consensus. The number of FD stents used, status of the deployed FD stent (successful, kinked, stenosed, foreshortened or herniated), aneurysm occlusion status on baseline and follow-up DSA and balloon angioplasty during the procedure were recorded. On follow-up DSA, the presence of ISS was assessed by the same neuroradiologists. ISS was considered present in the case of an intraluminal filling defect protruding beyond the borders of the metallic stent. ISS was graded as mild when stenosis was <25%, moderate when 25–50%, or severe when >50% of the parent vessel lumen was stenosed (figure 1). Three different patients with flow diverter stents showing mild (A), moderate (B) and severe (C) in-stent stenosis on short-term digital subtraction angiography follow-up. Variables are reported as mean±SD and number (percentage). Categorical variables were compared using the Fisher exact two-tailed test and continuous variables were compared with the Mann–Whitney U test, with a P value set to <0.05 for statistical significance using MedCalc for Windows, Version 12 (MedCalc Software, Mariakerke, Belgium). Between July 2012 and June 2016, 54 patients underwent treatment using SILK FD stents for intracranial aneurysms. Thirty-six patients had completed short-term and long-term follow-up cerebral angiograms. Of the 18 that were excluded, 11 patients were missing short-term or long-term angiographic follow-up in the pre-specified time frame, three patients are awaiting long-term follow-up angiograms, and four patients were lost to follow-up due to death, relocation, or refusal of further management. The mean age of the subjects included in this study was 54.8 years (range 39–75 years) and 27/36 (75%) were women. Twenty-six of the 36 aneurysms (72%) were located in the anterior circulation and 19 (53%) were ruptured. All aneurysms were treated with a single FD stent except one case where two overlapping FD stents were deployed. Two patients had their FD stents deployed in pre-existing stents. Angioplasty was performed during FD deployment in 75% (27/36) of cases. Thirty-three of the 36 FD stents (92%) were successfully deployed; however, two FD stents demonstrated residual kinking and one showed residual focal stenosis that persisted despite balloon angioplasty. On short-term angiographic follow-up, the incidence of ISS was 44.4% (16/36). ISS was mild in 68.75% (11/16), moderate in 18.75% (3/16), and severe in 12.5% (2/16) of cases. The stenoses were diffuse in 68.75% (11/16) and focal in 31.25% (5/16). On long-term angiographic follow-up the incidence of ISS was 13.9% (5/36); 68.75% (11/16) of mid-term ISS cases showed complete resolution, 18.75% (3/16) showed improvement, and 12.5% (2/16) showed worsening stenosis. No case of de novo ISS was observed on long-term angiographic follow-up. A dual antiplatelet regimen was maintained in 13 of the 16 patients diagnosed with ISS at mid term. Clopidogrel was prematurely discontinued in the remaining three patients (by the patients themselves in two cases and by the treating physician in one patient). Two of these three patients demonstrated worsening of ISS on long-term follow-up angiography while the third patient showed complete resolution. All patients with ISS were asymptomatic including those in whom the long-term angiogram showed worsening ISS. Univariate analysis showed no association of ISS development with any of the factors studied (table 1). Worsening of ISS on long-term angiographic follow-up was, however, associated with premature discontinuation of the second antiplatelet agent (P=0.038). The overall reported incidence of ISS in FDs in the literature ranges from 3.5% to 57% with different FD stents (table 2). This wide range is likely due to different definitions and grading of ISS used by different authors. Some authors, for example, consider <25% narrowing as non-stenotic or intimal hyperplasia,6 14 15 while others consider only >50% narrowing as significant.5 John et al classified stenosis of <25% as intimal hyperplasia in patients who were treated with the PED and found an ISS incidence of 9.8%. If <25% stenosis was classified as ISS, the overall ISS incidence in their series would have risen to 41.2%.6 Similarly, Lylyk et al reported ISS only for stenosis >25% in patients treated with the PED and found an incidence of 18%.14 If <25% stenosis was excluded in our series, the incidence of ISS on short-term angiographic follow-up would fall to 14% (n=5). Most of our ISS cases (69%) consisted of <25% stenosis, in accordance with other reports in the literature.7 However, we believe that <25% stenosis should not be overlooked; one of our subjects with <25% stenosis at mid-term follow-up showed stenosis progression on long-term follow-up after discontinuation of clopidogrel. Digital subtraction angiography (DSA) of a patient with a flow diverter stent maintained on dual antiplatelet therapy after short-term follow-up showed moderate in-stent stenosis (A) which completely resolved on long-term DSA follow-up (B). Aneurysms treated with FD stents are occluded by two mechanisms: (1) flow diversion, which leads to thrombosis in the aneurysm lumen; and (2) endothelialization across the aneurysmal neck. The latter is the main mechanism of long-term and permanent occlusion.4 The mechanism of stent endothelialization has been extensively studied for coronary stents and progresses through three phases: mechanical injury, intimal hyperplasia, and healing.17 18 A few studies on FD stents have demonstrated similar histological findings.4 In a recent animal study, neointimal thickness was found to be more extensive in FDs compared with high-porosity stents.19 As ISS is reported in the different FD stent devices, we believe that ISS is inherent to all FD stents likely due to increased strut density. In our institution, if the lack of ISS on gold standard DSA imaging could not be proved (eg, patient refused DSA, lost to follow-up, or missed short-term DSA follow-up and only had MRI/MRA), patients were advised to continue dual antiplatelet therapy for a minimum of 12 months. No ischemic complications detectable on standard clinical or MRI follow-up were noted. 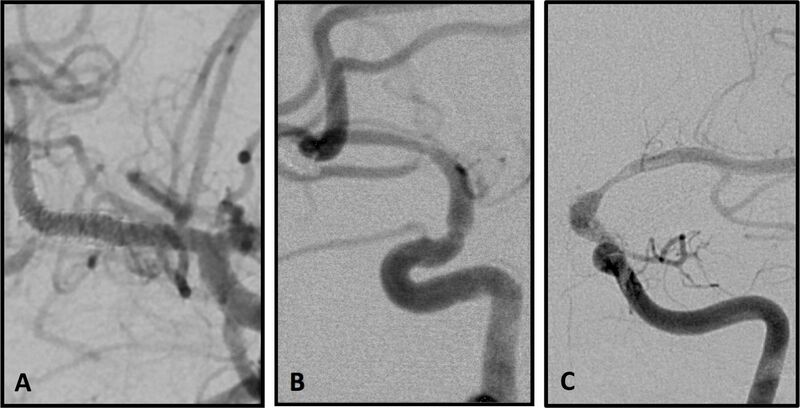 Digital subtraction angiography (DSA) of a patient treated for a right middle cerebral artery bifurcation aneurysm (A) with a flow diverter (B). The patient discontinued one of the antiplatelet medications despite the short-term DSA follow-up showing moderate in-stent stenosis (C). The stenosis progressed to severe on long-term follow-up (D), but the patient remained asymptomatic. DSA of the contralateral side demonstrates the development of collateral supply to the affected territory (F) when compared with an earlier angiogram (E). Reported protocols for imaging follow-up are heterogeneous; DSA follow-ups every 3 months until aneurysm occlusion has been described, as well as more or less frequent imaging.5 6 14. Our protocol included a short-term DSA follow-up in order to evaluate the stent lumen and the need for dual antiplatelet therapy, and a long-term DSA follow-up to evaluate the stent lumen and the aneurysm occlusion status. This is a single-center retrospective observational case series limited by a relatively small number of subjects. The procedure technique and management strategy were, however, homogeneous. The time intervals for angiographic follow-up were arbitrarily selected to capture the dynamic nature of ISS. Larger prospective studies with fixed follow-up time frames could further elucidate the clinical characteristics and evolution of ISS. In this retrospective observational case series of 36 patients treated with SILK FD stents, ISS was found to be a common, transient, and asymptomatic finding on short-term angiographic follow-up. Complete resolution or significant improvement was seen in most patients who were maintained on dual antiplatelet therapy.
. In stent restenosis: bane of the stent era, 2006:232–40.
. In-stent stenosis after p64 flow diverter treatment. Clin Neuroradiol 2017 May 9 [Epub ahead of print]. Contributors Study concept and design: FE and DI. Data collection and analysis: all authors. Literature review: FE and DI. Manuscript drafting: FE. Manuscript revision, editing, final approval and accountable for all aspects of the work: all authors. Ethics approval Ottawa Health Science Network Research Ethics Board. Data sharing statement Additional data can be acquired by contacting the corresponding author.